Perhaps one of the most recognizable edible fungi that grows in the autumn in the lion’s mane. 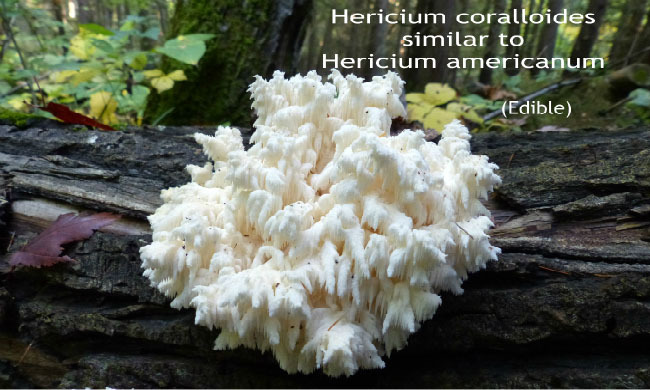 Hericium americanum (other common names include bearded tooth mushroom, bearded hedgehog mushroom, or pom pom mushroom) is an edible and medicinal mushroom belonging to the tooth fungus group. This fungi typically fruits from August to November producing a white spore print and they are easy to spot when on a hike. It is a saprophytic fungi that does not discriminate when it comes to what dead or dying hardwood tree to develop on. Typically you will find them on dead maple, beech, walnut and oak. It can also fruit from the wounds of living hardwoods. Lion’s mane is Native to Canada, the U.S., as well as in parts of Europe and Asia. 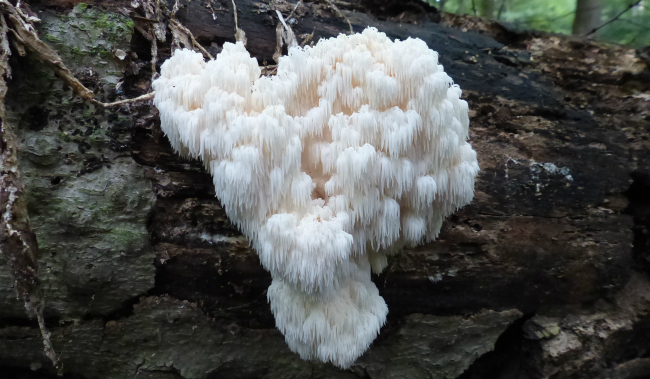 According to fungi expert Michael Kuo, Hericium americanum is North America’s only Hericium species with long spines and a branched fruiting body. There is a close (and edible) lookalike, the Hericium coralloides. All members of the genus produce more or less globoid white fruiting bodies covered in downward cascading spines. As this fungi ages the white tendrils will become beige to brownish in colour. The taste of lion’s mane is highly desired by chefs because they have a very pleasant aroma and taste. Like all edible fungi, you must cook this first before consuming. The centre of the lion’s mane is white and has lots of “meat” (if it is not white it is not edible). The icicles are edible too so long as they are white! The interior “meat” part of the fungi dehydrates very well. I cut it into pieces that measure about 4cm x 4cm – after dehydration I store them in a sealed mason jar in a dark, cool location. I find this size is perfect for adding them into soups throughout the winter. I also grind some into powder and add it into meals. If desired, you can cut up fresh lion’s mane and sauté it with a little bit of butter and serve with your favourite meals. Inoculating logs with fungal spores has become a very popular way to grow your own favourite edible fungi including lion’s mane. It may sound like a complicated process, but it is actually quite easy. Patience will be required when growing your own fungi because generally speaking you will have to wait a year after inoculation before you get your first harvest of fungi. The best part though is that they will come back for several years. This fungi contains five polysaccharides and polypeptides than are incredible for stimulating our immune system. Lion’s mane shows significant inhibitory effects on sarcoma 180 as well as cancers of the esophagus, stomach and skin. Studies have been conducted that show that in dried pill form, lion’s mane has extended the life of cancer patients. Lion’s mane is immunomodulating, a nerve tonic really and has been proven very useful for those with chronic bronchitis. There is a lot this fungi has done to help a variety of health issues but perhaps one of the most exciting advancements in scientific study is that lion’s mane has helped some elderly patients who had Parkinson’s disease, Alzheimer’s, spino-cerebellar degeneration, cerebrovascular disease, degenerative orthopedic disease as well as other ailments. In clinical use, lion’s mane is known as a dietary supplement based on positive human clinical studies for brain health, memory, and mood. It has been shown to increase neurotrophic activities by stimulating nerve or brain cell growth, which could possibly be responsible for the mushroom’s purported brain-strengthening and antidepressant effects. Our body’s nerve growth factor system produces proteins that help to maintain the central nervous system’s cholinergic system in the forebrain. The forebrain is where most decision-making, memory, and cognitive thinking occur. Research shows that the forebrain size decreases in cases of Alzheimer’s disease. The bioactive constituents in lion’s mane known as hericenones and erinacines (diterpene compounds) can spur production of nerve growth factor in nerve cells, thus helping to maintain the forebrain function. An in-vitro study found that lion’s mane extract at a concentration of only 0.0001%, when added to nerve growth factor in brain cell cultures, stimulated the production of nerve growth and caused specialized nerve cells to increase their growth by 60%. This effect may pose encouraging potential for neurodegenerative diseases such as amyotrophic lateral sclerosis (Lou Gehrig’s disease), Parkinson’s disease, multiple sclerosis, and Alzheimer’s disease. It only makes sense to get into a forest and start looking for this incredible fungi. For those who want to grow their own lion’s mane, do an online search to find a local supplier who can help you. And for those who want to consider using this as a medication you MUST seek the advice of a qualified professional who will advise you further about this medicinal fungi. M Nagano et al., “Reduction of depression and anxiety by 4 weeks Hericium erinaceus intake,” Biomedical Research. K Mori et al., “Improving effects of the mushroom Yamabushitake on mild cognitive impairment: a double-blind placebo-controlled clinical trial,” Phytotherapy Research. PL Lai et al., “Neurotrophic properties of the lion’s mane medicinal mushroom from Malaysia.” International Journal of Medicinal Mushrooms. CW Phan et al., “Therapeutic potential of culinary-medicinal mushrooms for the management of neurodegenerative diseases: diversity, metabolite, and mechanism.” Critical Reviews in Biotechnology. Rogers, R. D. (2011). The fungal pharmacy: The complete guide to medicinal mushrooms and lichens of North America. Berkeley, CA: North Atlantic Books. I suffer with depression I have been on medication for years. I am so tired of feeling like a jombie. I would love to find out how I can get some of this lions mane to see if it will help me. Thanks for the information it sounds like a wonderful plant or fungi if it does really work. A Miracle !!!! Tissy Franklin Glaeser. You say it’s easy to grow Lion’s Mane fungi but in what exact weather conditions doest it grow? Or it’s best to grow it in a controlled environment? I’ve seen something similar to these in the forests near the city I live and am wondering whether it’s the Lion’s Mane or the lookalike, will definitely need to research more on the matter but will love to know whether or not it’s possible to grow it in my garden. It’s a hard to find the best quality Lion’s Mane. Google what’s the best brand of Lion’s Mane and put that brand into Amazon. I personally like to shop on amazon because I feel I will get what what I want fast and the product would be genuine. Ps this is a great website. This is fabulous news and I am so happy for your wife – and you! Thank you so much for sharing this with us!